AUSTIN, Texas — Unlike previous elections, fear and worry played a heavy hand in both the 2016 Donald Trump and "Brexit" elections, changing the script on how personality shapes political behavior, according to an international psychological study on voting behavior. Research has long established that political attitudes are associated with the Big Five personality traits. For example, prior studies show low openness and high conscientiousness to be related to conservativism. But in 2016, two campaigns built on populist themes of fear, lost pride and loss aversion awoke previously uninfluential traits, particularly those of anxiety, anger and fear — all of which are aspects of the Big Five trait of neuroticism. "The models traditionally used for predicting and explaining political behavior did not capture an essential factor that influenced people's voting decisions in 2016," said lead author Martin Obschonka, a psychologist and associate professor in entrepreneurship at QUT. "We propose a kind of "sleeper effect." Under normal conditions these traits have no influence, but in certain circumstances, widespread anxiety and fear in a region have the potential to profoundly impact the geopolitical landscape." The researchers found correlations between higher levels of anxiety and fear in a region and both the Brexit and Trump votes, and an even stronger influence of such traits when considering Trump gains since the 2012 election, when Mitt Romney was the Republican candidate. 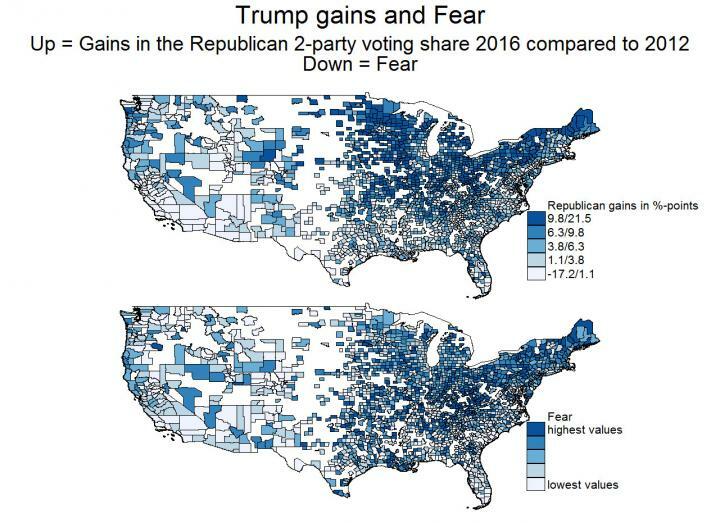 The 50 U.S. counties with the highest levels of fear and anxiety showed a 9 percent increase, on average, in Republican votes from 2012 to 2016; whereas the 50 counties lowest on fear and anxiety showed a shift of only 2 percent. Similarly, the 50 U.K. districts with the highest levels of fear and anxiety demonstrated an average of 60 percent support for the Brexit, with the lowest 50 districts supporting Brexit at the 46 percent level. Researchers also considered the role of region's industrial heritage, political attitude, racial composition, educational attainment and economic conditions. In England, rural areas and industrialized locations had both higher levels of anxiety or fear and Brexit votes. And in the U.S., these personality traits also predicted Trump support in battlefields such as Pennsylvania, Wisconsin and Ohio, as well as the Midwestern "Rust Belt."